While my first rack is getting finished I'm already driving myself crazy for making an additional rack. 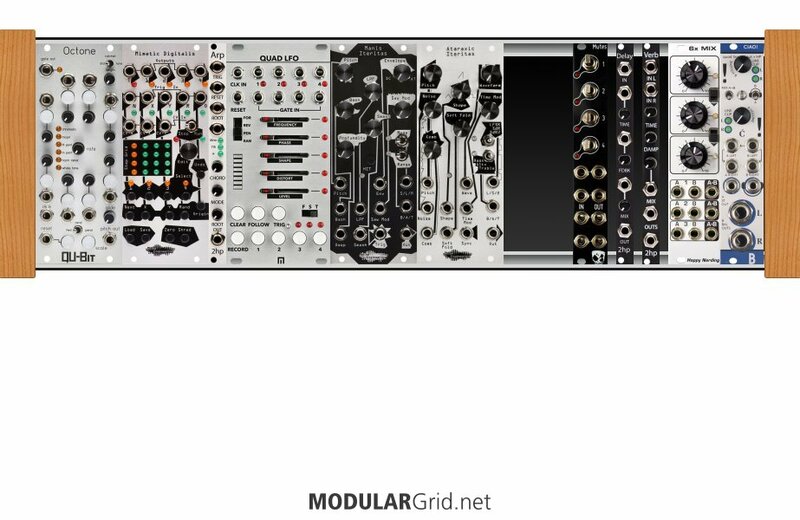 The rack is quite straightforward a 4 voice synth which combines all the elements from a techno-ish beat. The Varigate to drive all the voices which will receive a clock signal from my main synth. The Dinky for the drum sounds, The Mutant for some hat action, BIA ripples and Quad LFO for a bass line (the LFO will be used for more modulation with other modules) and yes I stole this setup from Ricky Tinez ;-) , the AI to add some melody and the Prism to add some effects. In my opinion a solid build which has all the basics to make some music. This synth will be an addition to my existing setup but also needs to be able to function as a stand alone unit. This build is designed around the Noise Engineering modules because I really dig their sound! First of all thoughts on my build? Would you make changes? Please tell me! My second question is about the mixing section... I cannot sort it out properly and could use some advice! For the ones interested I came up with a solution myself. I changed the PanMix for the 6xMix so I can mix all my voices. Then the mono out goes to the left B input from the Bastl Ciao! The manual states that the signal is then normalled to all other channels which gives my a line level stereo output!